As part of jobs.ac.uk’s long-term commitment to supporting postgraduate study, we’ve recently launched a dedicated ‘Find PhDs’ portal at www.jobs.ac.uk/phd. The new PhD portal has been has been designed alongside feedback from our postgraduate audience to help make finding PhDs on jobs.ac.uk even easier. Looking to advertise a PhD? In addition to the new PhD portal, we have also launched four new PhD products to help recruiters to advertise their PhDs to postgrads much more effectively. 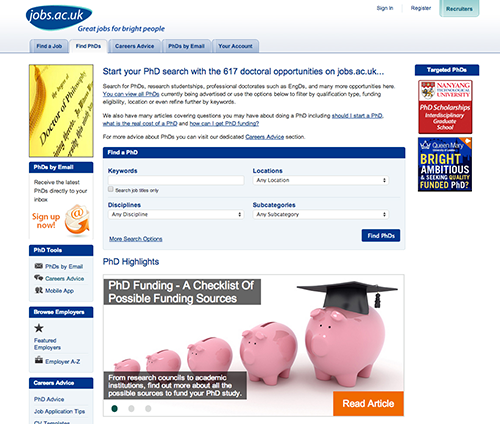 You can find out more about how to advertise your PhDs using our new PhD products here.